Day one in downtown Havana: sightseeing here we come. I’m barely out of the van when a guy waves me over to a gorgeously restored Chevy: a ‘56 Bel Air sports sedan. “I give you a ride, señor!” He tries to push me inside. He’s in my face, and I scurry away. Another local falls in beside me, grinning as if he were a long-lost brother. “Ola, amigo!” As we walk, he scratches out a caricature in his notebook with a felt pen. He finishes, thrusts it at me. I see glasses and moustache, but nothing else I would recognize in a mirror. Meanwhile, another dude corners Annie. They’re “Picasso” and “DaVinci,” they say with straight faces, and the bargaining begins. I know better, but we pony up for their “art” anyway. We’ve been had – fleeced the first morning out. How embarrassing; we’re not newbie tourists! That was the beginning . . . but it turned out to be the exception. 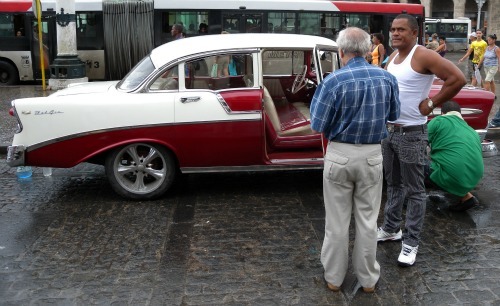 Some Cubans do ask us for money, but quietly; we’re never hassled. Others just want to chat.